On January 26th 2016 I made some new friends: the lovely people at Leaning Palm Resort in Gales Point, Belize. Taunya, Ken and Nigel. 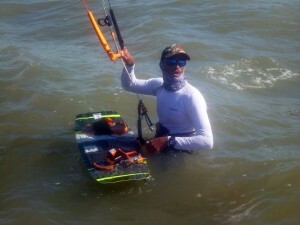 I was chasing a kite-surfing solo long-distance world record, and I stumbled upon an unforgettable experience when I crash-landed 56 nautical miles south of San Pedro. I landed at a place I have wanted to set foot on for years but never got the chance to till now: the forgotten coast between Belize City and Dangriga. I fell in love with the pristine untouched beauty of the vast expanses of nature. It is the last place Belize remains untouched. The lush green tropical forest towers above the narrow sandy beaches where the wind blows and little waves crash with energy every second as if power washing the shoreline. Hundreds of sea birds rule the sky! Watching them fly effortlessly above lush beach coastline with no man-made structures for 20 mile stretches in either direction felt truly Jurassic. The Maya Mountains hundreds of feet up into the western horizon loom behind the coastline like giants lying asleep. My adventure ended with the discovery of a passion that has been inside me for years. I was meant to kite-surf to this place. To meet these new friends, and return to teach kids from the nearby village the wind sports. That way they can enjoy their surrounding coastline: sailing, windsurfing and kite-surfing. I will be organizing, funding and doing a free week long sailing summer camp for kids in Gales Point, Belize this July. It will be hosted by my new friends at the Leaning Palm Resort Ken, Taunya and Nigel. Sailboats are being supplied by our Belize Sailing Center in San Pedro, where I work. The name of the camp is "Sail and Sea" summer camp, and its slogan is "Passion for the sea, wind and waves." In the months to come before summer is here, Nigel and I will attempt to refurbish a few forgotten small sailboats in the jungle in preparation for the camp. Hopes are to turn the summer camp in to an annual event. Love and support is already starting to pour in from around the country and the world. This is for the kids. The goal is to teach the kids sailing techniques, navigation, seamanship and environmentalism. In the upcoming months I will continue my chase of the long distance world record for kite-surfing solo down-winder. On April 2nd, I and a group of like-minded friends will be windsurfing and kite-surfing in a 100 mile group down-winder. From San Pedro to Placencia, we will surf to promote protection of our Barrier Reef and coastlines, as well as the wind sports and a safer Belize. One of the key reasons Gales point is an excellent place to have the event is because the coastline there is a Sailor's paradise. Even people that don't live there can come to enjoy it.